When people talk about spending their holidays in the Alps, they mostly refer to France, Germany, Austria or Switzerland. 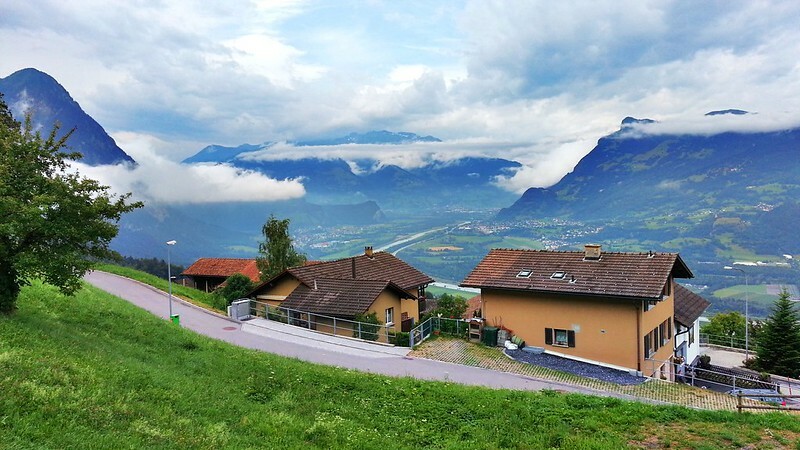 Today I would like to offer you an alternative: A one-day (or even a two-day) trip to the 6th smallest country in the world situated in the Alps: Liechtenstein! Since Liechtenstein doesn't have an own regional or international airport arriving by air is possible via Zürich airport (Switzerland, a 2-hour drive to Liechtenstein) or the regional airport in Altenrhein/St. Gallen at the Swiss-Austrian border via Vienna (People's Viennaline connects the town with Vienna airport daily). Consider the cheaper transportation via local Liechtenstein buses #11 and #14 either from the Austrian town of Feldkirch (train station) or bus #11 from the Swiss town of Sargans (train station) to Vaduz, Liechtenstein's capital. I spent two days in Liechtenstein. Even though Vaduz is the capital of Liechtenstein feel free to search an accommodation throughout the whole country: it has the size of Washington, DC. I stayed in Triesenberg, a village in the higher areas of the country. Schaan is rather the industrial area of Liechtenstein and Vaduz the administrative one. You might also consider staying in Malbun, deep in the Alps, for more romantic feeling! At first we're going to explore Liechtenstein's capital, Vaduz! It's the administrative center of the country and also the place where the Prince of Liechtenstein resides. From the bus stop in downtown Vaduz we head to the east into Städtle, the pedestrian area of the town. The Liechtenstein art museum features plenty of contemporary art exhibitions, events for kids and discussion panels in this modern building. All the oversized stamps in the pedestrian area are actually ads for the post stamp museum. Here you can buy unique stamps from Liechtenstein. The entrance to the museum is free. Liechtenstein's official currency is the Swiss Franc (CHF), the same as in Switzerland. Credit cards are widely accepted in hotels and splurge restaurants. Having CHF in cash is always a good idea. You can exchange money in the Liechtensteinische Landesbank in downtown Vaduz (pedestrian zone). Supermarkets in Liechtenstein have a lunch break and close at 6:30 pm. In case you need anything after 6.30 pm you'll need to drive to neighboring Switzerland (Sagrans or Buchs) where supermarkets have longer opening hours. Most Liechtensteiners shop "abroad" when they need furniture, electronics, equipment etc. since the supplies of these are limited in tiny Liechtenstein. Vaduz. The square in front of the City Hall can serve as a beach volleyball field like here for an international championship. We pass by the Liechtenstein National Museum (the building used to house Liechtenstein's government) and reach a bright square named after Peter Kaiser. The square sometimes offers nice open-air exhibitions. The government buildings of Liechtenstein are located on it. Vaduz. Peter Kaiser Square. St. Florin Cathedral in the background. [video] Art installation in #Vaduz downtown, #Liechtenstein. Vaduz. St. Florin Cathedral, church art in the yard. Vaduz. St. Florin Cathedral, interior. Vaduz. St. Florin Cathedral, church art in the yard, part 2. The Schloss Vaduz (Vaduz Castle) is the private home of the Prince's Family. There is no possibility of entering it but the view above it is lovely! There is a (long) walking path starting from behind St. Florin Cathedral leading all the way up to the castle. The vilage of Triesenberg is reachable by car or by bus. Feel free to take bus #21 from the bus stop opposite Liechtenstein hospital (down the road from St. Florin Cathedral). It will take you straight up the mountain to Triesenberg (and beyond to Malbun). If you are riding a bike: no problem! Bikes can be attached to the back side of Liechtenstein bus #21 in summer. Per bike you'll pay around CHF 3 (2.83 €). Triesenberg. View to Triesen, Balzers (and to Switzerland). Liechtenstein bus network is quite developed: Here you can ride a local bus within three countries: Bus line #11 goes from Feldkirch, Austria, passes through Liechtenstein and continues to Sagrans in Switzerland! Pricing is divided into rather complicated zones according to the duration of your ride and your destination. One-way prices vary from CHF 2 (around 2€) for a short trip to an all-zones one-way ticket of CHF 11.80 (around 11€). Day cards vary from CHF 5.60 (5.30€) to CHF 23.60 (22.30€) (check pricing here). Bikes can be taken onboard in case there's enough space. Buses operating for line #21 to Triesenberg and Malbun have special designated mounts at the back side of the bus. A bike ticket costs CHF 3 (2.83€). Triesenberg. St. Josef Church will the local city hall. This museum in downtown Triesenberg shows the history of the Walser community: an Alemannic population inhabiting the Swiss and Liechtenstein Alps. The square in front of the museum offers some nice chillout options. There are a few cafés and 1-2 restaurants around or down the street. The Swiss Denner supermarket chain has a tiny satellite here and is just a few meters away. You can also walk up the road to Hotel Oberland which offers a beautiful view to the valley (and to Switzerland!) from their restaurant terrace. + Do you speak... Alemannisch? Although the official language in Liechtenstein is German (the only country that doesn't border to Germany but has German as an official language) most locals speak the so called Alemannic dialects (Alemannisch). They are widely spoken throughout Liechtenstein but also in Switzerland, parts of Austria, Germany and France, even in parts of Venezuela! Liechtenstein people are very fond of their dialect and don't like it when they or their language are compared to Swiss or Swiss German (Schwiizerdütsch). Liechtensteiners greet each other with "Hoi!" And "Goodbye!" is... "Ciao!" On our way further to Malbun we pass by the Triesenberg Stadium: As you may think it is quite demanding to build a big stadium on a slope. Well, Liechtenstein has a solution here! The bus #21/car journey to Malbun gives us some gorgeous photo opportunities on our curvy way up the Liechtenstein Alps. The tiny hamlet of Malbun is located at 1 600 m above sea level and is beautiful, especially on a summer evening. Or in winter when the slopes are covered in snow and joy is on its way. The place is easy explorable by foot in summer. Malbun. The "village center" is quite manageable by foot. Most roads outside the village are banned for vehicles however. Malbun. The peace chapel can be also reached by car via a gravel road. Malbun. The well in front of the peace chapel. The village of Balzers is located in the south part of Liechtenstein. It is serviced by bus lines #11, #12E, #12 and #13 from Vaduz. The Swiss town of Sagrans is a few kilometers over the Rhine river to the southwest. The church is situated at the foot of Balzers Hill. It was designed by Austrian architect Gustav Neumann. Inaugurated in 1912. Newest archaeological discoveries prove that the hill at Burg Gutenberg has been inhabited since Neolithic times! The castle used to be a sentry against the Helvetics in the 13th century. Since then the castle has been renovated a few times. It now belongs to Liechtenstein but till 2001 the property owner used to live in the castle. Today the building is used for different cultural meetings and events. The south side of the hill is used for wine-growing since Roman times. The street leading to it is closed for vehicles, hiking is the only option (calculate 15-20 minutes for walking up to the top). The castle (or at least the ruins of it) is not in Liechtenstein but in Switzerland, a few kilometers south of Balzers. Locals call the place also Mörderburg (Murderer castle). There is an urban legend dating from 1498 according to which the looting knights living in the castle used to kill robbed merchants by throwing them from the hill. Liechtenstein is one of the two doubly blandlocked countries in the world (the other would be Uzbekhistan). It is surrounded entirely by one or more landlocked countries (requiring the crossing of at least two national borders to reach a coastline). Liechtenstein doesn't have an army. The country's last military maneuver was in 1866. The Liechtenstein "army" consisting of 80 soldiers actually returned uninjured with one more person: an Italian soldier who befriended them. Liechtenstein doesn't have highways or airports. Liechtenstein's car plates consist of the abbreviation FL (for Fürstentum Liechtenstein) followed by a number. The Prince's car has the number 1. Liechtenstein was neutral in WWII and guarded family treasures in the middle of the war zone. Liechtenstein imports around 90% of its energy from abroad. Liechtenstein has one of the lowest crime rates in the world. Its jails are basically empty. Liechtenstein was the last country to grant women voting rights. That happened in 1984. Schaan, the biggest town in Liechtenstein, is the country's industrial center where instant meals, mechanical parts and dentist accessories etc. are produced, mostly for export. One of Liechtenstein's 2 TV channels features a show where local people intoduce themselves and offer different services like carpentry, financial advisory or banking. Liechtenstein. A chilly sunset over the Alps. Weather in Liechtenstein remains preasantly cool even in the summer months. Liechtenstein. Night falls over the country. Seen from Gaflei, a small hamlet over Triesenberg. In case you want to relax after the long hiking day I can recommend a visit to one of the few swimming pools of Liechtenstein: The country has one open-air 50-mter public pool in Vaduz and (now) four 25-meter roofed pools in Schaan, Balzers, Triesen and Eschen. To quote the pools' website of the municipality: "... and don't swallow too much pool water!" Went swimming in Triesen. There are only 3 indoor swimming pools in whole #Liechtenstein. All are 25 meters long.